The name, Caramel French Toast says it all. This delicious, make-ahead wonder, easy Oven-Baked Caramel French Toast Casserole, is filled with crusty french bread soaked in sweet creamy caramel and then baked in a decadent and dreamy custard sauce. This oven-baked caramel french toast casserole is luscious, easy to make and has been a tradition and my “go-to” make-ahead dish for Christmas mornings for many years. Since you make it the night before, you can just sit back and enjoy the compliments, at this most special time of year with those you love. Oven-Baked Caramel French Toast Casserole is a perfect make-ahead breakfast or brunch for anytime you have house guests you want to spoil. 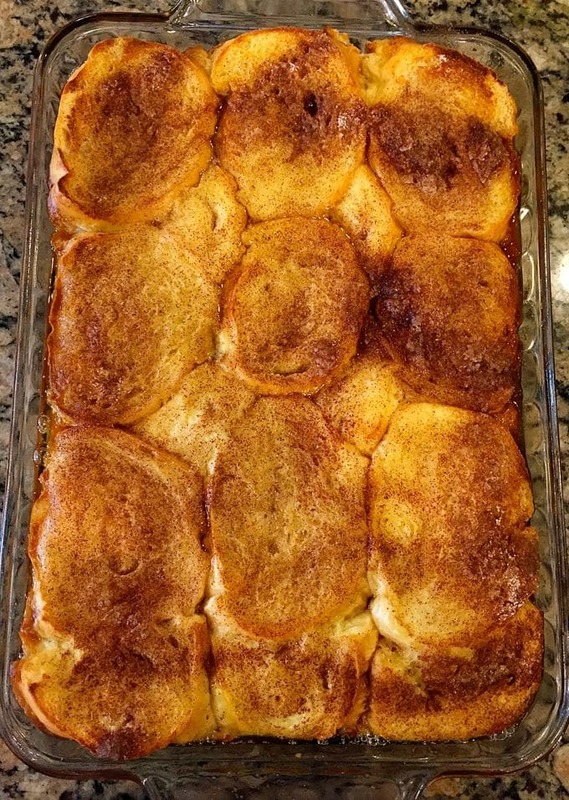 When this french toast casserole bakes, it puffs up, and your home is filled with fabulous cinnamon and caramel smells. I can promise that you and your family will love, love, love this decadent and luscious dish! 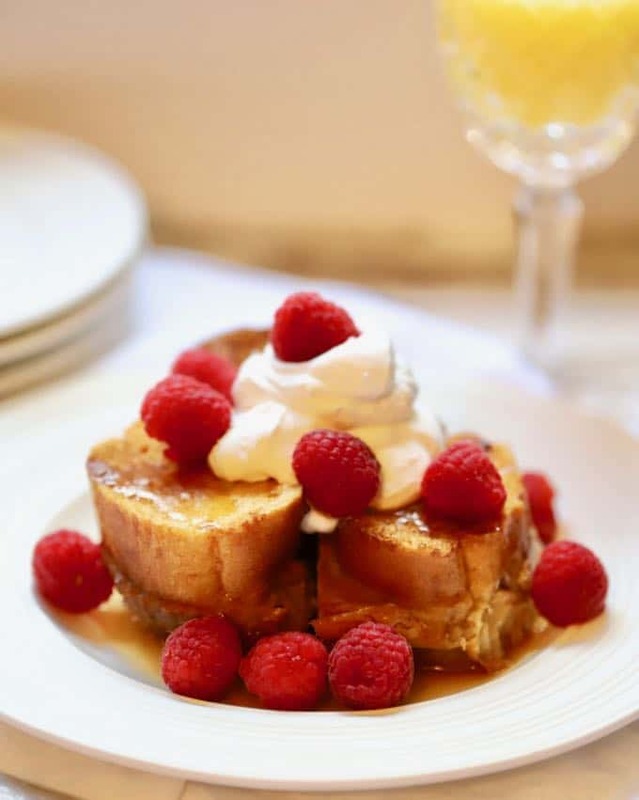 Looking for more breakfast or brunch ideas and recipes like my delicious Oven-Baked Caramel French Toast Casserole? Check out these other delicious choices: Southern Cheese Grits Casserole, Cheesy Prosciutto Breakfast Casserole, Foolproof Eggs Benedict, and Butterscotch Pecan Coffee Cake. 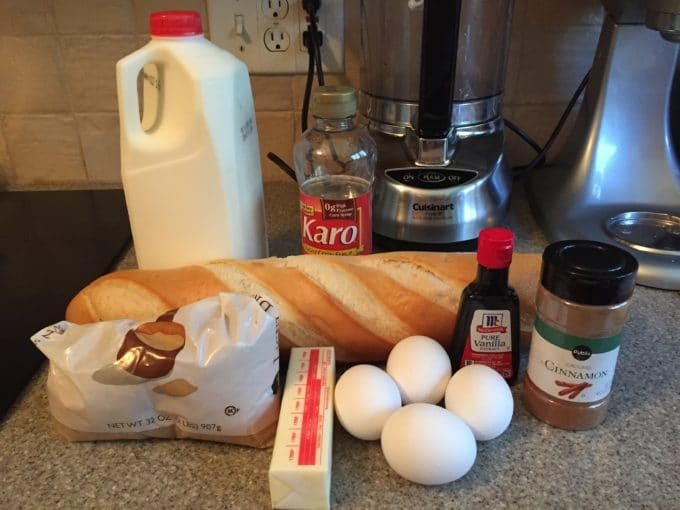 To begin, gather your ingredients which include: brown sugar, butter, light corn syrup, French bread, eggs, milk, vanilla extract, salt, granulated sugar, and cinnamon. You will also need a 9 x 13 baking dish. To make the caramel sauce for this french toast casserole, stir together brown sugar, butter, and light corn syrup in a medium saucepan over medium heat. Stir constantly, until the mixture is bubbly, or about 5 minutes. Pour mixture into a 13×9 baking dish which you have sprayed with non-stick cooking spray. Slice the bread into approximately 1 1/2 inch wide pieces. Place on top of the caramel layer. Whisk together eggs, milk, vanilla extract, and salt. Pour over bread slices slowly, making sure you cover them all. Cover tightly with plastic wrap and refrigerate overnight or at least 8 hours. Stir together granulated sugar and cinnamon. Sprinkle evenly over your bread slices. 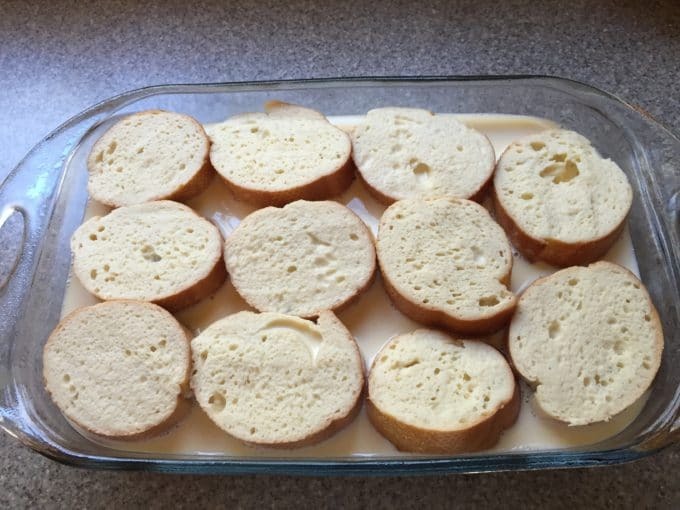 Melt the butter and drizzle over the bread, making sure to cover evenly. 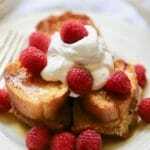 Bake at 350 degrees for 45 to 50 minutes, or until your baked french toast casserole is puffed, golden brown and bubbly. Let it stand for 10 minutes and serve. Serve this yummy overnight french toast casserole with delicious make-ahead Sausage Bread and Old-Fashioned Southern Ambrosia for a special breakfast or brunch to remember! Yum, just looking at this picture makes me want some! 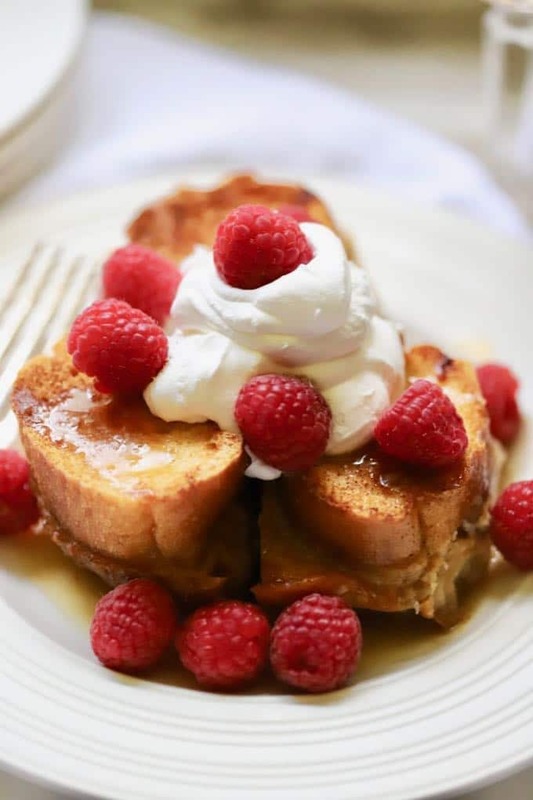 I have garnished this decadent caramel french toast casserole with whipped topping and raspberries for the photos, but with the creamy sweet caramel layer and luscious custard, this make-ahead french toast casserole is also delicious on its own without any additional toppings. 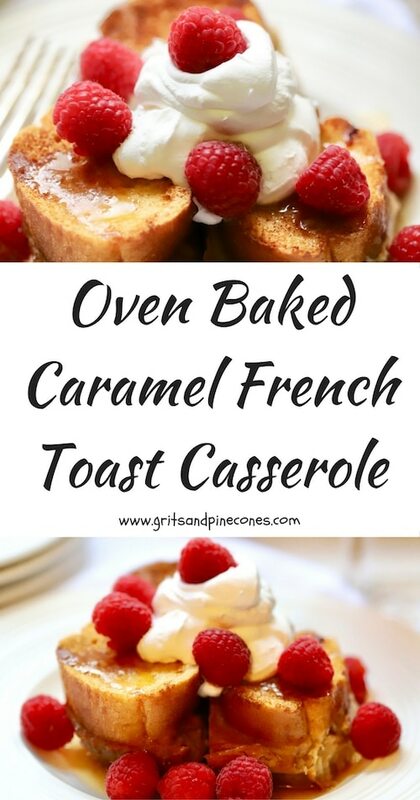 This easy Oven-Baked Caramel French Toast Casserole is a make-ahead, delicious and decadent breakfast or brunch entrée with a creamy layer of caramel and luscious custard. 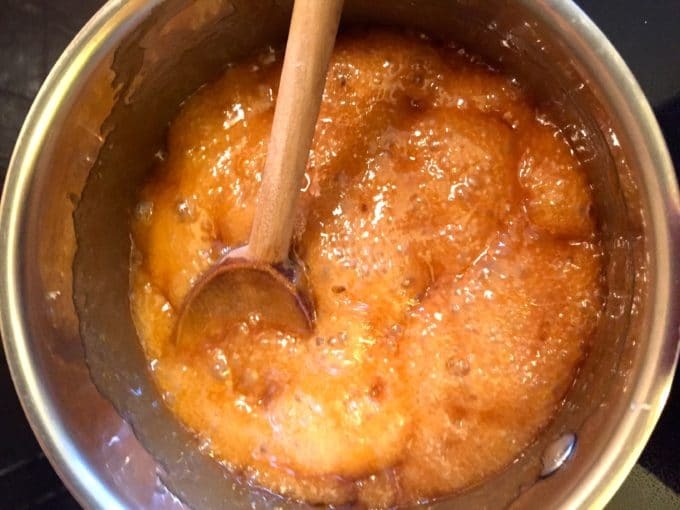 Stir together brown sugar, butter, and light corn syrup in a medium saucepan over medium heat. Cook for about 5 minutes or until the mixture bubbles, stirring constantly. Pour mixture into a 9x13 baking dish that has been sprayed with non-stick cooking spray. Arrange bread slices over caramel. Whisk together eggs, milk, vanilla extract and salt until everything is mixed well. 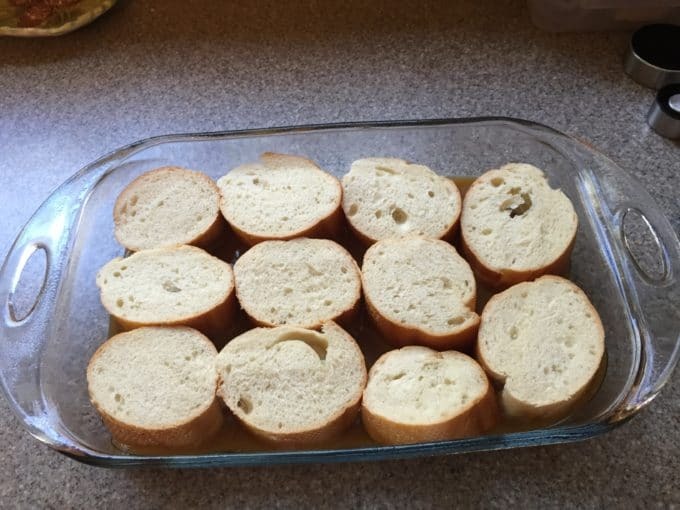 Slowly pour over the bread slices. Gently press the bread to make sure that it absorbs as much of the mixture as possible. Cover tightly with plastic wrap and store in the refrigerator for 8 hours or overnight. Mix together granulated sugar and cinnamon. Sprinkle evenly over the bread and drizzle evenly with melted butter. Bake at 350 degrees for 45-50 minutes, or until golden brown, puffed, and bubbly.